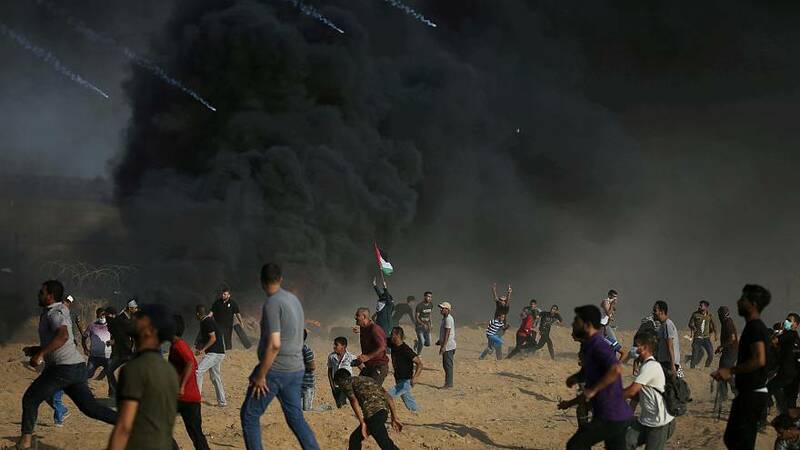 The funeral has taken place in Gaza of a Palestinian teenager who was hit by Israeli fire during a border protest and later died of his wounds. Fifteen-year-old Mouad Ziad Al-Sur was one of two Palestinians killed in Friday's protest, in which at least 220 others were wounded. His grandmother, Umm Ziad Al-Suri, said: "We will continue until we free Jerusalem - even if we lose all of our children. God is great, thank God." The Israeli military said about 8,000 Gazans had participated in the protests at five locations along the border. The military said troops responded after some protesters broke through the border fence and attacked troops with firebombs and an explosive device.